Clean, Cute, & Close to everything!! NEWLY DECORATED efficiency( no stove) and a BRAND NEW PILLOW-TOP QUEEN SIZE MATTRESS!!! Oceanview Condotel is without a doubt the best deal to be had on the island. An ideal getaway for couples, small families, golf fanatics, fishermen and beach lovers who appreciate a quiet, non commercialized, family oriented beach. Our low cost means YOU BRING your own SHEETS (queen size), BATH TOWELS, and TOILETRIES. If you want us to provide the sheets it is $50 extra. We have a brand new trex deck to layout, eat, or watch the sunset set! CALL US ABOUT SPECIAL WINTER MONTHLY RATES!!!! **Special Rate: Book 1 week for $800 plus tax during PEAK summer time!! Except for July 4th week. This charming suite is decorated beautifully with two new flat screen t.v. 's in bedroom and is located only two blocks away from the beach. Perfect for the person who does not want to spend too much in their room, but most of their time on the beach!!! 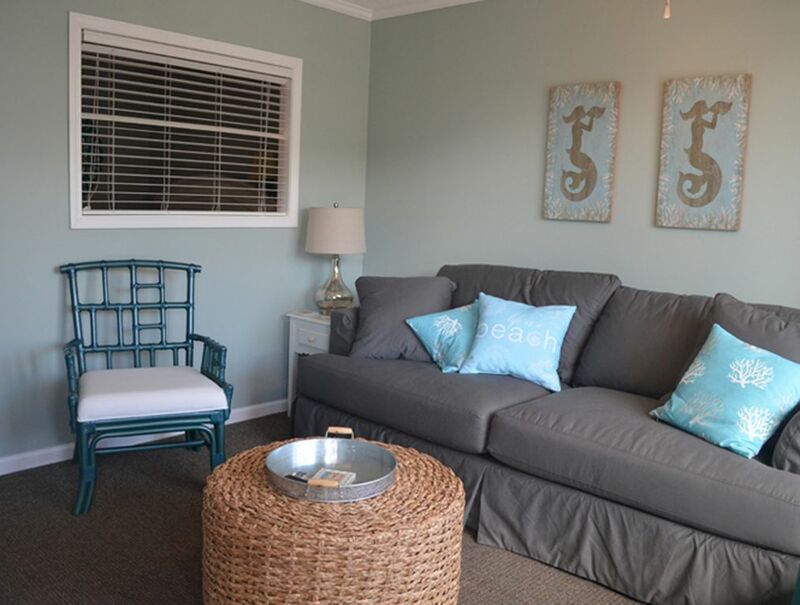 Perfectly situated on the main strip as you come over the beautiful OIB Bridge, you're within walking distance of great outdoor bar and restaurants , an ice cream parlor, the fishing pier, miniature golf, coffee shop, surf shop, a playground, and more!! The condo is available for daily rentals all year long. SEE RATES BELOW. *Special Rate: book for 1 week for $800 plus tax except July 4th week!! The Novak Family resides in Richmond, Virginia. They have 3 kids, Molly (21), Emily (17), and Andy (16) and also a Cavalier King Charles named Rudy. The Novaks have been going to Ocean Isle Beach for over 20 years and have many family members living there as well. Their favorite OIB activity is the Annual 4th of July Parade where the kids were known to make quite a profit off of lemonade stands. The Novaks hope you would rent their condo, you won't regret it. Newly decorated... the 'Suite Escape' is located right at the heart of a bustling community of ice cream stores, putt putt, surf shops, parks , churches , the pier, and of course, the beach! The condo unit includes a community pool, picnic tables , parking and inside includes a microwave, coffee maker, and mini fridge. Also, a brand new trex deck to layout, sit, or watch the sun set! Extremely easy access to lots of activities and a VERY short walk to the beach (150 yards) . We take pride in our condo being very clean. Newly professionally decorated this year with all new furnishings and brand new couch, bedspread and freshly painted walls and brand new floors . New couch pulls out to queen sleeper with memory foam mattress vs. uncomfortable coil springs mattress and cross bar. TWO Flat screen TV's for both sides of the room (one for kids and one for parent(s). Shower & bath tub plus a dual sink vanity. 150 yards walk to the beach. Sea Trails Golf Course and Brick Landing Golf Course just a 5 minute drive. Can see the ocean from our balcony in the distance. AC plus 2 ceiling fans. Free internet with passcode. This is provided on confirmation letter upon booking. Bring your own coffee and mugs. Coffee filters provided under right side vanity. size 4 . Efficiency only, NO stove. It DOES have as a mini-refrigerator, microwave, & coffee-maker. Two large flat screen tv's in family room and bedroom. Books stored under left side vanity. Board games are stored under left side vanity. Lounge chairs and tables and chairs. Beautiful view of the sound. Gorgeous at sunset! Tables with umbrellas and chairs to sit in. Surf Unlimited across the street. Brand NEW CEILING FAN over the master bed to keep you cool & comfortable while you have your BEST nights sleep on our amazing new mattress!!! Also, enjoy our clean & beautiful brand new wood flooring!! Nice place to come back to from a day of fishing. We had plenty of room. Nice to be close to the pier. Darrell thank you very much. Lots of folks love our place just for what you mentioned...easy access to beach and fishing. Thanks for staying with us and please come back and see us again next time you're in OIB! Awesome place at the beach! Wonderful place to stay! Condo is very nicely decorated and very clean! Great place to stay for vacation! The room was very clean and close to the beach. It was a short walk to everything! Will recommend to everyone I know! My daughter and I stayed from Tues-Sun for some R&R - salt, sun, fishing, swimming and to see some beautiful Mustangs! We had a very pleasant experience. There was one small “hiccup” that was IMMEDIATELY addressed by the owner. She was very nice and was able to get us back in business in no time. The Ocean Isle Police Dept is next door (literally), we could not have felt safer. The walk to the beach was short without dealing with loads of traffic or crowds. The sunrise on the ocean to the sunset on the river right behind us- was nothing short of spectacular. We met a lot of very outgoing and friendly people by the pool and the community deck. Although there isn’t a “kitchen”’we were able to take our small portable grill and grill out on the ground level where there are picnic tables and more space to hang out with your family and friends. The room was perfect for us. No hassle of waiting in lines to check in and out. There was something going on there on the island about every day.... yet it was calm and peaceful. If you are looking for the “party beach” this is not it. OIB is a perfect getaway spot. Thank you Ms. Novak for allowing us to stay at your “home away from home”. We had a wonderful and relaxing time and wish we could have stayed another week! Very nice condo-close to everything! We stayed 3 nights-could not have been happier! OIB is our favorite beach and your condo is updated,clean,and reasonably priced! Great stay-will stay again! Property was great, situated right in the middle of everything, very quiet. Monique was great and had everything ready to go! She made herself available, but it was such a nice easy user friendly experience it ran on auto pilot! Thank you so much! Calabash, NC is a 15 minute drive and has a great Nautical Gift & Christmas Shop and two of my favorite restaurants. Becks Seafood ( Crab legs 2 lbs $24.99) and The Boundary House . Reservation recommended for Boundary House 910-579-8888. No reservations taken at Becks. Check-in time 4 p.m. Check-out time 10 a.m. Once your reservation is confirmed you will get the lockbox code to open condo. The key MUST be returned by 10 a.m. for housekeeping to clean the condo for next guest. If the key is returned on time and there is no damage to condo the guest will receive the deposit back.Bring your own beach towels, chairs, and any extra bath towels.